Coming of age is a loaded phrase. It implies growth towards maturity over time. But the times that surround us as we struggle to find our identity can have as much impact on who we become as our core character traits. The America that Boyet Hernandez finds as he arrives in 2002 looks pretty normal. 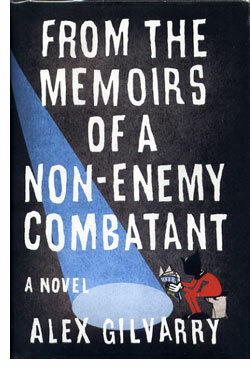 He's a struggling twenty-something fashion designer who leaves the Philippines and lands in New York somewhere near the beginning of 'From the Memoirs of a Non-Enemy Combatant,' a comic but intense and moving first novel by Alex Gilvarry. Post-9/11 America leaves its mark on Boy, who in the course of the novel becomes a man. As we immerse ourselves in Boy's life, it's possible to look back on our own lives and see how we all came of age in the years since that fateful attack. We all had some growing up to do — and we're not done yet. Gilvarry is a crafty and smart writer who frames his bildungsroman of a man growing up in New York after the turn of the century with a dark political vision of the war on terror. We don't meet Boy until we've been told that the book we are reading is his memoir, plus "footnote annotations, the author's acknowledgements, the editor's afterward and a supplemental article included with permission," by Gil Johannessen. We're reading a book within a book when Gil begins by telling us how much he loves America. And that, by the way, he's known as the "fashion terrorist," who is currently writing what we read while cooling his heels in No Man's Land — Guantanamo Bay. The story that follows is told on two time tracks; from his arrival in the US to the point where he was arrested, and from the time he was asked to write his memoir until the book's present. Gilvarry makes use of this complicated structure to — surprisingly — simplify his storytelling and give his tale a sense of page-turning tension. The bildungsroman of a young &#eacute;migr&#eacute; from the Philippines who arrives with hopes of making his way in the world of New York high fashion is intercut with clips from Boy's imprisonment in Guantanamo Bay. As readers, we can hardly turn the pages fast enough to find out both what will happen to imprisoned Boy and how &#eacute;migr&#eacute; Boy ended up in prison. For readers such as myself, who not only find fashion uninteresting but actually somewhat repellent, Gilvarry manages to engage our sympathy and indeed delight us with Boy's voice. As he arrives, Boy is unabashedly naïve and callow, but his enthusiasm for his profession is contagious. Gilvarry's prose reveals Boy as an unreliable narrator who is so wrapped up in his work that he's oblivious to the world around him. Boy isn't stupid by any means. He's smart and somewhat catty, with a sarcastic wit. But he is focused on his goal to the exclusion of everything else, even relationships. Boy's true love is fashion, and Gilvarry's skill as a writer makes us like and respect Boy for this, to the point where we believe in Boy's innocence even as he writes from prison. Gilvarry's book is often very funny, but he is able to drive to the plot to farcical levels without straining our credulity. We believe that Boy could have the ill-luck to end up working with an Irishman named Ben Laden, in part because Gilvarry knows how to precisely modulate his tone and make Boy's story poignant by making Boy's joie-de-vivre at finding his way in the world fashion real. As Gilvarry brings the twin plots together, readers will find that the coming-age-story has real momentum. Part of the charm of the novel comes from the cast of characters. Gilvarry gives us just enough detail to believe in the made-up denizens of the faux-fashion world he creates; Olya, Boy's first model, Philip Tang, his mentor and competitor, and Michelle, his well-heeled girlfriend. On the No Man's Land side, we're shown a nicely toned-down vision of the worst we might imagine. By underplaying the politics, Gilvarry is able to make trenchant observations without seeming overbearing. But growing up in a democracy of immigrants haunted by a terrorist attack is clearly no piece of cake. Ultimately, 'From the Memoirs...' manages to pack in quite a bit more than one might think possible in its brief 300 pages. It's a starter course in haute-couture fashion, and a well-written Bildungsroman, a term that Boy even uses to describe his fashion. It makes its political points without ever shouting, and it will make you laugh as well. The story-within-the-story is engaging, and that frame helps to add both structure and an entertaining perspective. Gilvarry might write about runway fashion, but his novel is clearly ready-to-wear.